How to apply: For details of advertisement and required qualification, age, categories, other eligibility criteria of the above notified engagement and how to apply etc. 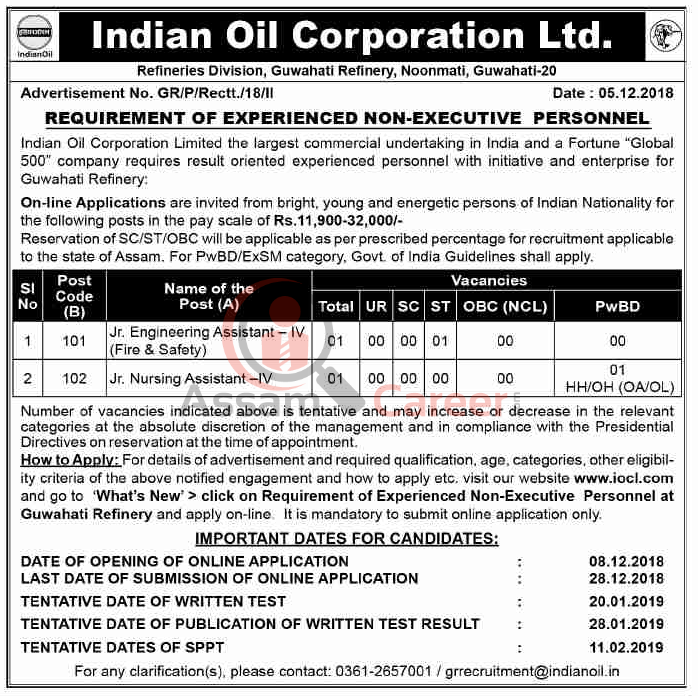 visit our website www.iocl.com and go to 'What's New' > click on Requirement of Experienced Non-Executive Personnel at Guwahati Refinery and apply on-line It is mandatory to submit online application only. TENTATIVE DATE OF PUBLICATION OF WRITTEN TEST RESULT : 28.01.2019 - TENTATIVE DATES OF SPPT 11.02.2019 .